All MopTop products are water-soluble and infused with natural ingredients, including aloe, sea botanicals, and honey. They also have clean, citrus-based scents for all-day fresh-smelling hair. 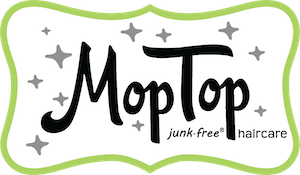 MopTop has made thoughtful product ingredient choices and feels less is more when it comes to restoring moisture and manageability, softness, definition, and shine to hair. The fewer ingredients, the healthier for your hair and the smaller footprint we leave on the environment.